0:01Skip to 0 minutes and 1 secondIn Salman Rushdie's words 'Migrants have experienced a triple disruption, a loss of place entering into an alien language and being surrounded by beings whose social behavior and codes are very unlike sometimes even offensive to their own'. Rushdie's formulation enables us to draw the parallels between migration and translation with confidence. This nexus is particularly applicable to my own interest my own research interest which is translingual narratives, in other words those narratives written by authors who are writing not in their first language or some people call them exophonic narratives. I prefer to call them translinual because I like anything with the prefix- trans. 0:45Skip to 0 minutes and 45 secondsIn these narratives, these narratives often seek to highlight the ways that translation has been or can be used to renegotiate identity, by focusing on how cultural heterogenity is produced in the dialectic between the local and the global, and through the spatial displacement of people. From the perspective of the everyday and the urban places of the city this suggests a world in constant movement and mobility constantly bringing previously disparate and distant ideas representations and experiences into local frames of references. 1:21Skip to 1 minute and 21 secondsFor some this process has been described as a destructive force, threatening to disrupt cultural homogeneity and the unique identities of place and is seen as inevitably leading to strange illegible and unfamiliar environments in which once familiar places can no longer be recognized. For others like anthropologist Massimo Canevacci this epitomizes what he defines the polyphonic city, a city which communicates through a multitude of autonomous voices that are related intercept overlap contrast with one another and are analogous to the textured singing of a polyphonic choir. In this video, Professor Rita Wilson talks about the connection between migration and language. She uses the image of migrants as ‘translated men’, first suggested by the writer Salman Rushdie. She also talks about how writers represent the experience of crossing linguistic boundaries and writing in a language other than their mother tongue. Rita Wilson stresses the polyphonic (consisting of two or more simultaneous voices or sounds) nature of our cities. 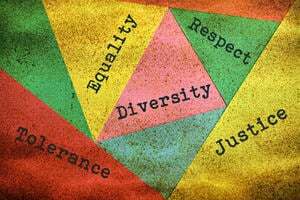 Linguists use the notion of ‘linguistic landscape’ to describe the way in which different languages are displayed, mixed, perceived or contested in public spaces (Tufi and Blackwood, 2015). And scholars of translation are also interested in the way in which languages face each other, overlap, or mix in multilingual cities (Simon, 2012). The images below give us a sense of the complexity of such landscapes. 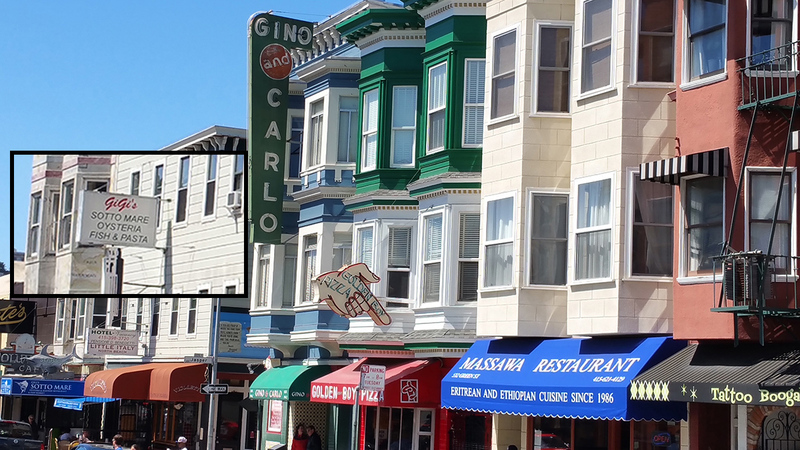 The first photo was taken in San Francisco, in an area which used to be the local ‘little Italy’, but where other languages and cultures now also mix with Italian and English. 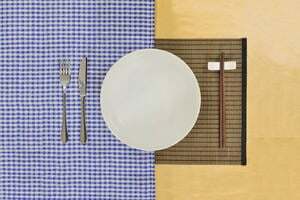 The image also shows how creative people can get when translating and mixing languages. Tip: Did you spot the word ‘Oysteria’: a mixture of the English Oyster and the Italian ‘Osteria’ (a small, informal restaurant)? Polyphonic cities are cities in which translation and multilingualism sit side by side, and are often mixed through forms of ‘translanguaging’ (Garcia and Wei, Translanguaging. 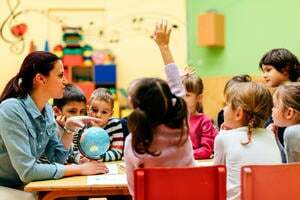 Language, Bilingualism and Education, 2014). 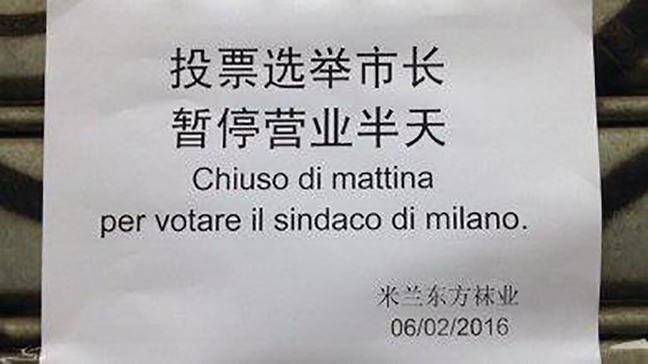 The second photograph is an example of this continuity and contiguity: it tells customers in Chinese and Italian that the shop on whose window it appears will be closed to allow the owners to vote in the elections for Milan’s mayor. By juxtaposing the two languages, the sign is making visible both multilingualism and the translation practices associated with it.